Trainer Tony McEvoy’s promising staying three-year-old Classic Weiwei continued on his path to the South Australian Derby with a game win at Gawler on Wednesday, April 3. 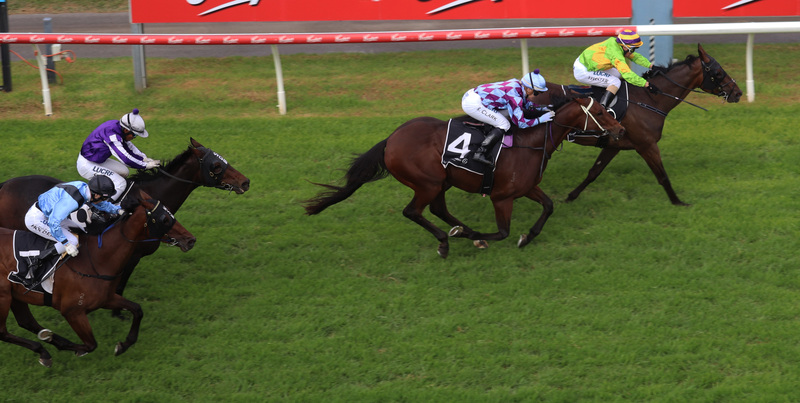 Easing from $1.90 to start $2.10 favourite, Classic Weiwei, ridden by Barend Vorster, scored a half-length win in the Goldin Farms Benchmark 64 Handicap (1700m) beating Igitur ($4.60). Assistant trainer Calvin McEvoy said he was hoping the three-year-old would continue on to the Group One $500,000 TAB South Australian Derby (2500m) at Morphettville on Saturday, May 11. “I think it was a really good win today,” McEvoy said. “He still got a bit keen through the early and mid-stages of the race. McEvoy said there was no doubt the gelding still had to step up a bit to be an SA Derby hopeful. “We think he has the right makings and believe he will stay. McEvoy also said it was a good effort for the three-year-old to win against the older horses, especially since he was carrying 57.5kg. For jockey Barend Vorster he kept up his trend of riding a winner on his first day at a new track and was impressed by Classic Weiwei. “He’s going to take some educating, but he has a touch of class,” Vorster said. “He got there too easily, too comfortable and he eased up on me, so I really had to get into him. “I think once he steps up in class and gets a more genuine tempo he’s just going to keep improving.